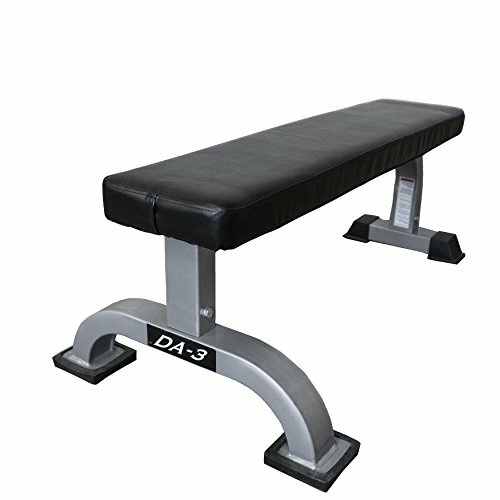 The DA-3 Valor Fitness Flat Bench is stable and strong. This is how you will look after using this unit for a multitude of workouts. This Flat Bench is built on a 4 point stable base. The arch base allows you to place your feet on a raised support as you recline during workouts. For some individuals, this helps take the pressure off the lower back. For others, it may be just the extra support they need for balance. In any case, this bench will deliver the same quality performance time and time again. High density, dual-layer pad measuring 43.5" x 10.25" x 2.5". Bench Pad height (floor to top of pad) 16.5". Arched base allows you to place your feet on a raised support. 4 rubber foot pads measure 4.75" x 4.75", 3.25" x 3.25". Max Weight Load: 550 lbs. Warranty: 3 Years Frame, 2 Years Pad. Assembly required.